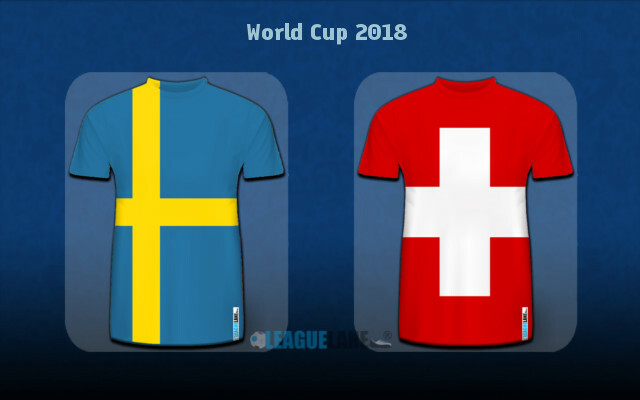 Sweden and Switzerland are set to clash each other in a low-profile last 16 round tie at the World Cup in Russia. Teams have five wins apiece coming into their 14th head to head meeting. We expect a tight affair with one or none goals to make the difference on the day. The winner plays either England or Colombia in the quarter finals. The draw has opened up nicely for Sweden and Switzerland who are set to play each other in the last 16 round tie on Tuesday afternoon in St. Petersburg. Whilst the Swiss side expectedly came runners-up to Brazil in their respective group, it’s the Scandinavians who shockingly ended up topping the Group F above the likes of Mexico, Korea and Germany to set the stage for such encounter at this stage of the competition. Janne Andersson has reasons to be thrilled by his team’s approach after conceding the last-gasp goal from Toni Kroos to lose the second-round outing with Germany at the death. The Scandinavians showed a huge mental strength to come back and produce their best performance of the tournament in what turned out to be a 3-0 drubbing of the Mexicans who have previously won two on the bounce in Russia. All goals came in the second half, Ludwig Augustinsson being the man who opened the scoring five minutes upon the restart. Granqvist double the lead 12 minutes later converting from the spot after Markus Berg was brought down in the Mexican box. The Swedes produced yet another stunning defensive display against a seriously strong attacking side of Mexico’s continuing from where they stopped before conceding two to Germany in the second round. La Nati are also known for their rock-solid defensive performances and you should not be tricked by the 2-2 draw they played against Costa Rica on the final day of the group phase. Vladimir Petkovic’s side were not forced to give 100 per cent in the second half of the clash with Los Ticos, whose both goals came after the interval. Janne Andersson made no changes in the squad that lost 2-1 to Germany in the second round. However, vice-captain Sebastian Larsson is injured and he could make way for Gustav Svensson in the middle of the park to partner Abin Ekdal. We expect the same starting line-up here expect the lone forced change, especially following the impressive all-round performance the team showed against the Mexicans on Wednesday. Sweden progressed from the group for the fourth time in a row at World Cups. Andreas Granqvist became the first Swede to net two or more goals at a single World Cup since Henrik Larsson back in 2002. 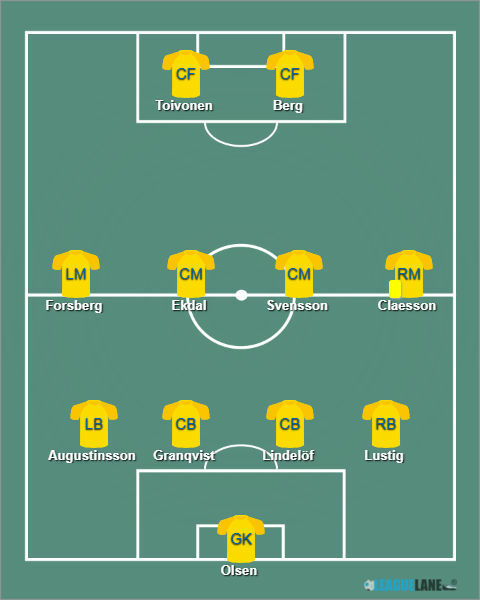 Olsen – Augustinsson, Granqvist, Lindelof, Lustig – Forsberg, Ekdal, Svensson, Claesson – Toivonen, Berg. Just as we expected, Breel Embolo got his place in the starting line-up against Costa Rica as Vladimir Petkovic made changes in the attacking third. Mario Gavranovic also came on for striker Haris Seferovic, while his substitute Josip Drmic bagged a goal in the 88th minute. For Switzerland’s round of 16 tie against Sweden, Vladimir Petkovic has some selection headaches. Captain Stephan Lichtsteiner and Fabian Schar are both suspended, while the impressive Steven Zuber is reportedly fighting to regain fitness amidst illness. Breel Embolo could retain his place in the starting eleven, while Johan Djourou and Michael Lang are expected replacements in the back four. Sommer – Rodriguez, Akanji, Djourou, Lang – Xhaka, Behrami – Embolo, Dzemaili, Shaqiri – Seferovic. Sides have five wins apiece coming into their 14th head to head encounter. This will, however, be their maiden clash at a major tournament as most of their previous ties came in qualifications for either World Cup or EURO. None of last three H2H outings offered three or more goals. Sweden are unbeaten in last three encounters with La Nati, two of which ended up in a draw. The previous clash had a friendly character and saw a 1-1 draw back in March 2002. Both teams see the tie as a huge change to each the last eight following the much easier-than-expected draw. The stakes are just massive and give n that both managers generally fancy the defensive-minded style, we can’t imagine a high-scoring affair on Tuesday. Therefore, the Under 2.5 goals FT should be a banker at the 1.44 odds. Punters who are after longshots can also chase the goalless draw, priced at 6.00 odds. We will take a more conservative approach backing no goals in the first half as we don’t believe any of two sides will take unnecessary risks going forward too much in the first 45 minutes. Correct FT Score: 0-0 Draw @ 6.00.